May is over already? Where does the time go? It seems to just fly by in the spring and there’s a lot of research to be done. 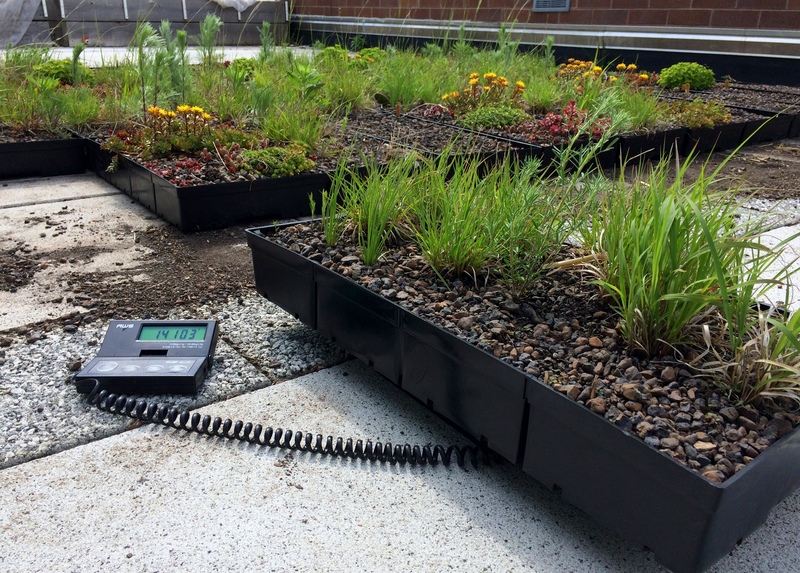 In May, I started measuring the plants from the green roof trays again. Despite a lot of rain, many of the plants were gone! Now that my experimental plots look a little more like prairies, the temperature probes are more difficult to find. At the risk of sounding like a broken record, yes, there was a lot to do in the lab in May. I’m still trying to complete a paternity test of about 600 baby plants and, wouldn’t you know, things that were working just fine a few months ago have stopped working and I can’t seem to figure out why. My advisor says, “welcome to the lab,” meaning, that sometimes this is just the ways things go. One day, things work and the next they don’t. So I’ve been spending a lot of time troubleshooting, collecting little bits of data and troubleshooting again. I am making tiny baby steps of progress in the lab but had hoped to be flying through the data collection process by now so it’s a little frustrating. 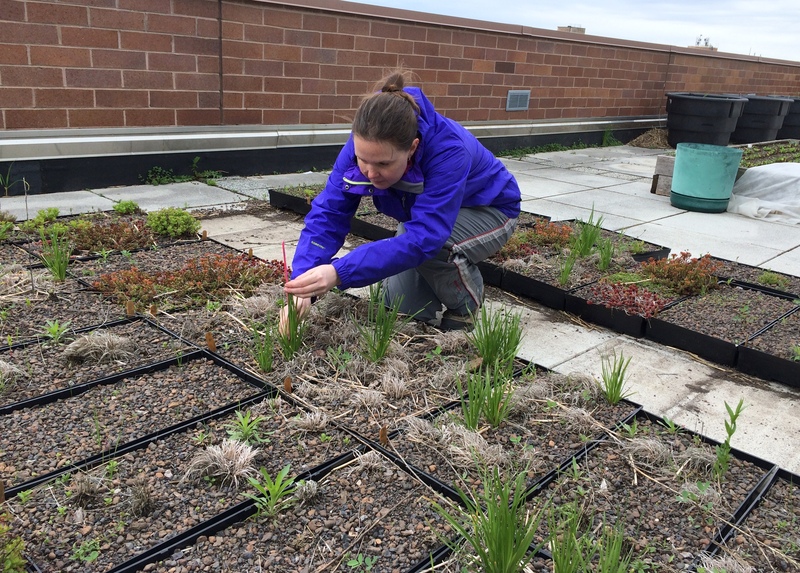 In any case, it’s almost time for a break in the lab because summer means lots to do on the green roofs. 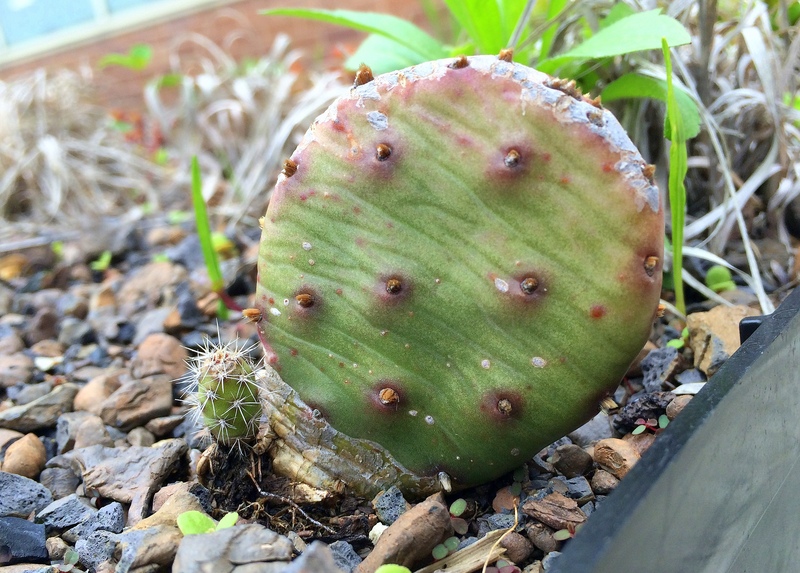 This little prickly-pear cactus has some new growth. Those “baby cacti” are so cute, right? Some of my native primrose plants were pollinated and seeds germinated. These new babies weren’t planted by me! 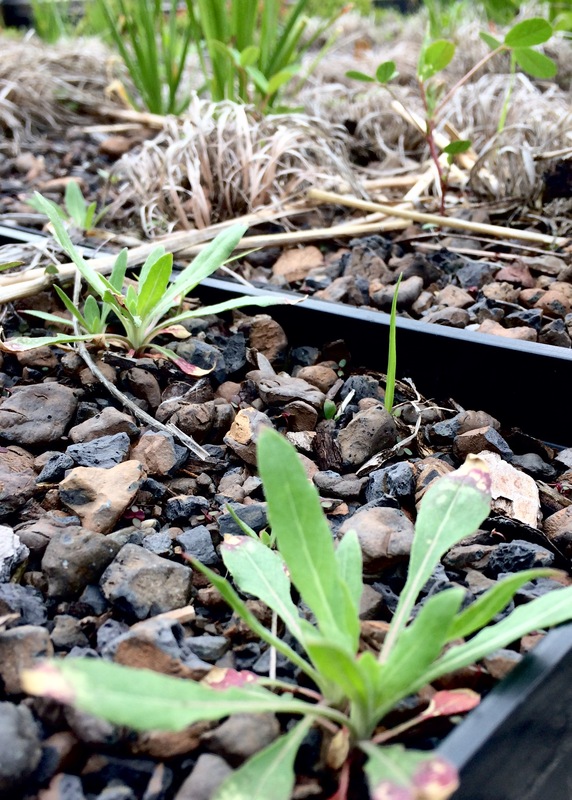 In May, I also finished collecting the temperature data from the green roofs and at the end of the month, I started measuring some of the plants again. There is some good news and bad news here. The good news is that many of the plants are still alive – for some species, this means that they’ve made it for almost 4 years now. Other plants are reproducing and there are new little seedlings popping up, so that’s exciting. The bad news is that it looks like many of the plants from my green roof trays that were doing so well last summer haven’t returned. I’m not sure if they were still dormant when I checked in on them or if they’re dead. I’ll return each month over the summer so I should know for sure in a couple weeks. My strip of experimental prairie is slowly starting to come back. The plants are still pretty short. Let’s see how this looks by the end of summer. As things started heating up on the roofs, my science communication schedule seemed to be getting hot too. I gave a presentation at the beautiful Lurie Garden in Millennium Park in Chicago. I was also the curator of a Twitter account called BioTweeps – this is where a different biologist interacts with followers and discusses their science. It was a bit overwhelming since BioTweeps has thousands of followers, but it was fun too! This past month I also continued taking a science writing class about communicating complex topics to non-scientists through newspaper and magazine articles (online versions too). I got to meet the editors of Discover Magazine and Audubon Magazine, which was a really great experience. I’m hoping that one of the articles I started writing during the course will be published and the editor of Audubon said she’s interested, so I’m keeping my fingers crossed and trying to keep my editing fingers typing. If it gets published somewhere, I’ll definitely include an update here. Next month looks like lots more work on the green roofs (June is the best month for measuring the plants!) and a couple interesting science communication workshops. See you then! In between spring thunderstorms, I collect my temperature probes from the green roofs and see how cold things got over the winter. Data have been recorded from the temperature probes. They’ve been cleaned and are waiting to be reburied once again. They’ll keep recording data until next fall. In April, I started to transition some of my work outdoors once again. Not much yet, but I’ve been to 3 of my sites so far to recover data from the temperature probes that have been buried all winter long. 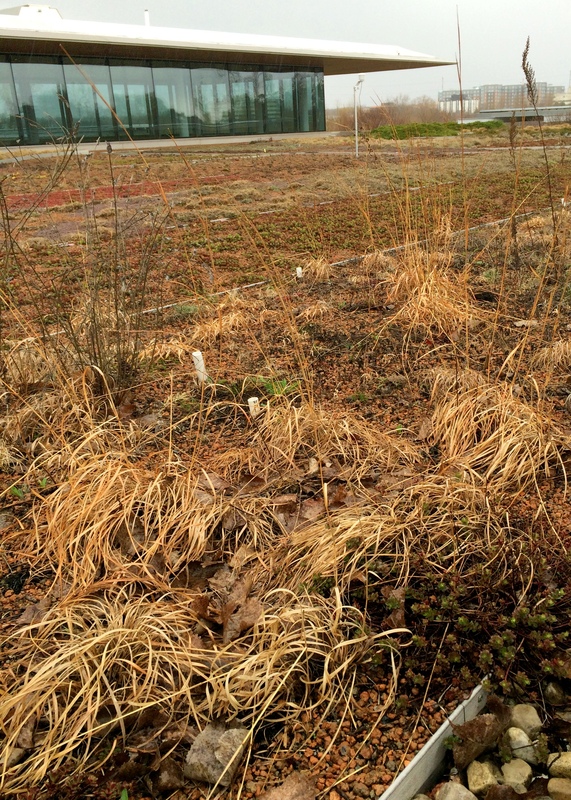 From the data I can see so far, I can tell you that it was a pretty cold winter on the green roofs! I’m glad I wasn’t a rooftop plant all winter long. Next month I’ll get the temperature data from the rest of my sites. Then I’ll try and figure out how to interpret over 10,000 data points representing the temperature readings taken every 3 hours for almost 2 years now. It’s a little overwhelming but I hope I’ll be able to tell an interesting story about how different green roof plants help insulate buildings. The lab got a new fancy machine that shakes up plant tissue so fast that the test tubes just appear as a blur. It kind of looks like some alien pod to me but it does its job beautifully! So that was it for the outdoor work. Back in the lab, things have been humming along. 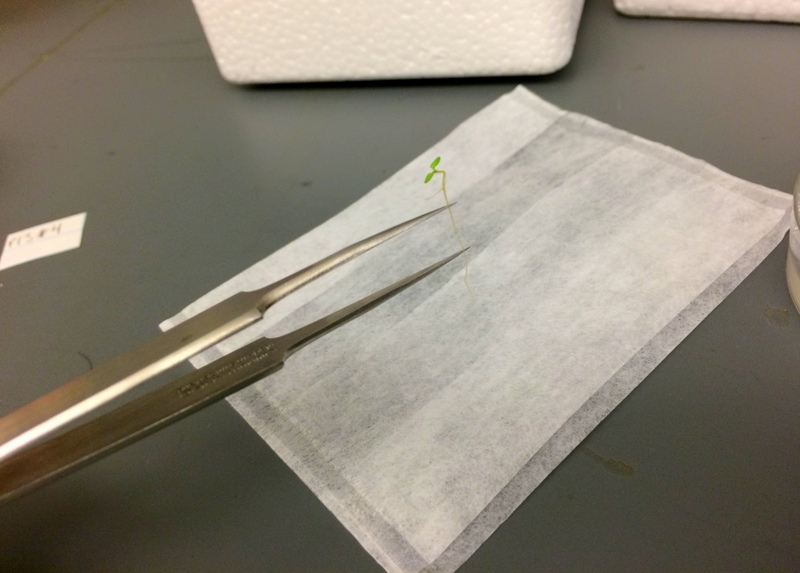 I just finished extracting the DNA from the second round of 2015 seedlings that I germinated over the winter. 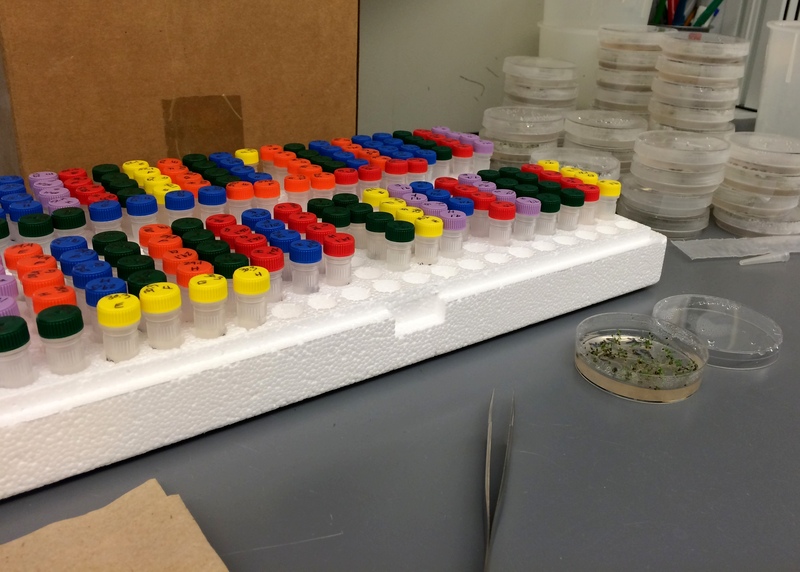 I’m almost finished with the DNA copying step for my 2014 seedlings (47/50 reactions – so close!). And I’m working away on genotyping the 2014 seedlings. The genotyping will tell me which types of genes my seedlings have for nine different sections of their DNA. When I’m finished, I’ll be able to match up the seedlings’ genotypes with their mothers’ genotypes. If it’s a perfect match, then I’ll know that the seedling was made by a process called “selfing” where a plant pollinates itself and is basically both mother and father. If the genotypes are not a perfect match, then I know the pollen for the seedling came from another plant. Then the search will begin to identify which plant is the pollen donor, or father. But I’m getting ahead of myself. Hopefully, I’ll be doing all those “paternity tests” by the summer, but with the outdoor research ramping up in May, well… we’ll just have to see. 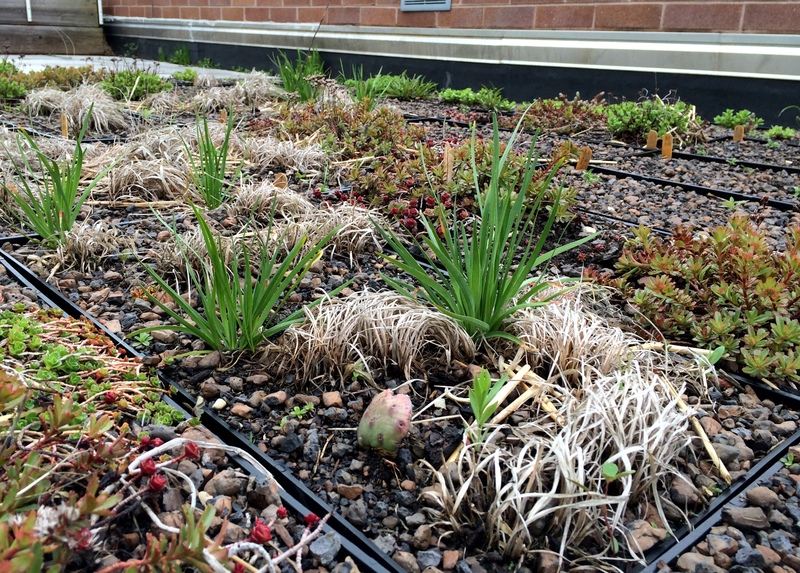 Half green, half brown, the plants in my green roof trays are slowly starting to come alive after winter. This past month I also started taking a course about science writing. Taught by journalism professors, the class is helping me gain some experience presenting complex ideas in ways that a non-scientist could understand. While this is something I’m already very interested in (hence, this blog!) it’s great to learn some new techniques. By the end of the course, I hope to be able to write an editorial article for a major newspaper. If it gets published, I’ll surely write about it here. Could it be? Is spring on its way? After a lot of working in the last this past February and March, it sure sounds nice to be able to work outside again in the near future! 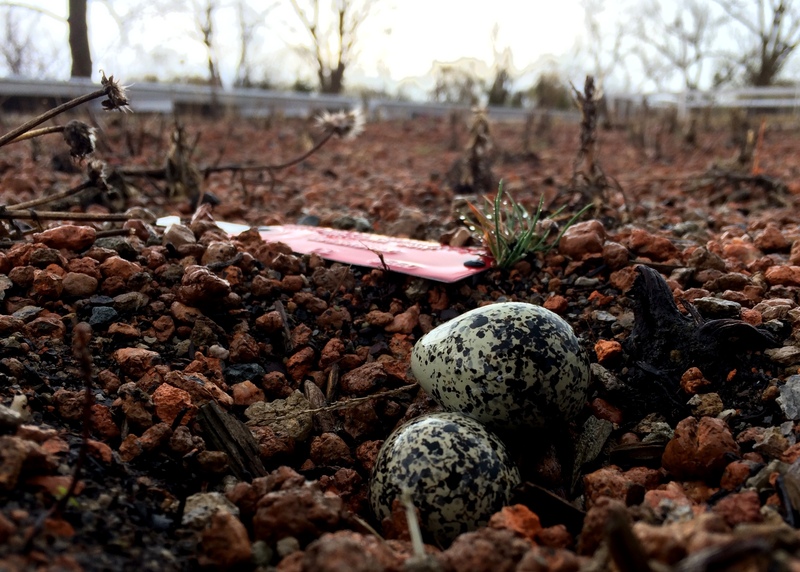 A killdeer has built its nest on the green roof at the Chicago Botanic Garden. This has happened every year and it’s nice to see a sign that spring is here once again! Just a few of the many test tubes filled with plant DNA that I’ve been working with the past two months. The winter to spring transition months included a lot of test tubes! I’m happy to report that I finally finished extracting the DNA from all of my little seedlings. That’s almost 550 samples. Phew! It took a lot longer than I expected just to perfect the technique of getting DNA out of such little bits of plant tissue but I was able to get the procedure streamlined enough and finally finished. The next step was to start the DNA amplification – a process called PCR that makes many copies of the DNA so I can work with it in the future. I need to amplify 9 sections of DNA in each of my 550 samples. If you’re doing the math at home, that’s nearly 5,000 reactions. 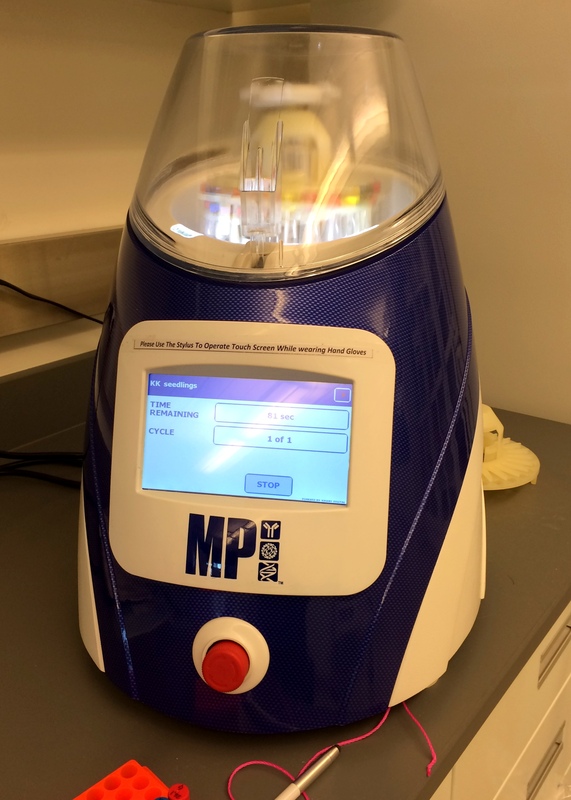 Luckily, there is a machine that helps me out with making temperature changes so the reactions can occur without my constant guidance but I still have the fun task of loading the test tubes with the correct materials – yep, all 5000 combinations. So that’s been most of my March and the project will continue into the future. 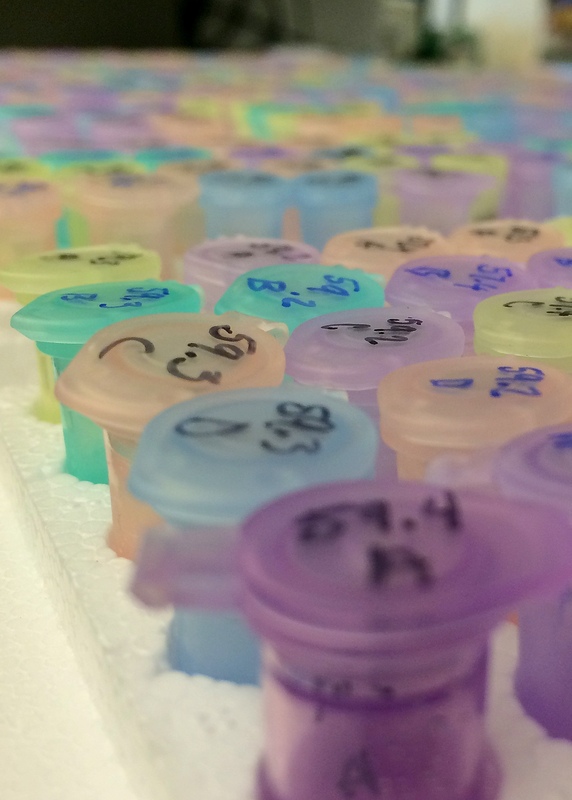 By the end of the month I was able to test some of the PCR samples and see if they worked. I’m happy to say that I’ve got mostly positive results so far. There are still a few kinks to be worked out but at least I know that things are moving forward in the right direction. The 2015 seeds have germinated. The seedlings are in these small tubes and are kept frozen until I can find the time to extract their DNA this spring. Things are looking pretty dormant in my green roof plots. But I know my plants are there. Just wait a few months! As March came to a close, I ventured out to a couple of my roofs just to see if there were any signs of life. It was a pretty mild winter but it still looks too early for most of my little plants to start growing yet. I guess I was just getting a little hopeful – wishful thinking! I’m looking forward to getting out to all of my green roof sights again this spring and summer. It’s hard to believe (but kind of exciting too) that this will be the last summer of data collection for my dissertation research. In the future, I’m not sure what will happen to these plots that I’ve established, but I think at least some of them will be left alone and the plants will just do what plants do; grow, reproduce… hopefully survive for many generations. We’ll have to see. One thing I do know is that it’s going to be a busy summer. 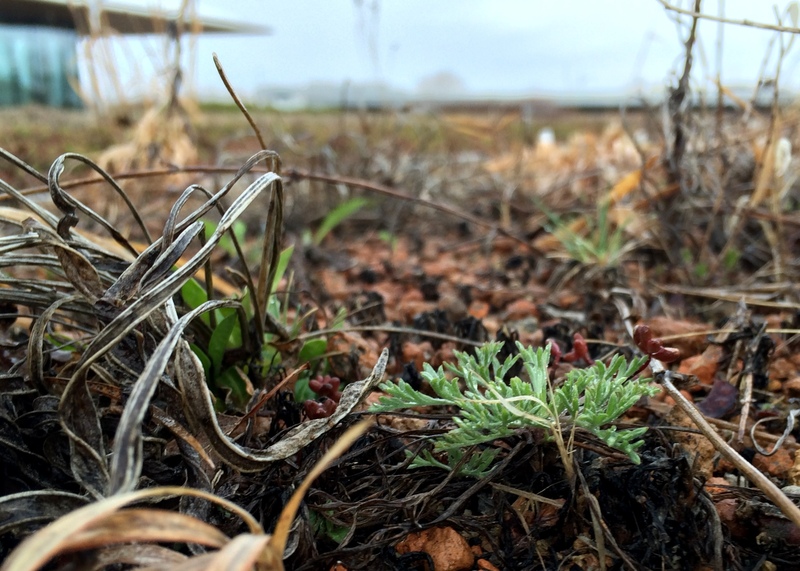 By the end of March, a few signs of life started to appear in my green roof plots. My temperature probes (like this one taped to the roof) have been recording data all winter long (hopefully). I’ll collect them again this spring to see what happened on the roofs while I was inside staying warm. In other fun news, my green roof children’s activity book has been featured, both on an industry website and in a non-profit magazine. My coauthor Olyssa and I were asked to write a little piece describing the unique features of our book for the international website greenroofs.com. Check out that story by clicking here. I was also interviewed by a reporter a couple months back (remember that photo shoot in December that I wrote about in my last post?) about the environmental education benefits of our book and a short piece was included in the Chicago Botanic Garden’s member magazine, Keep Growing. Check out that article by clicking here and going to page 74. We continue to have people download our free book and have recently even been asked to translate it into Dutch for a wider international audience. It’s great to know that people are enjoying the book and that our hard work is helping teach people about the benefits of green roofs! It’s hard to believe that spring has already come and gone. Yep, May is over and summer is officially here. It’s been a good past month for research with a lot of chances for me to collect more data on the green roofs and spread the word about the importance of native plants in cities. 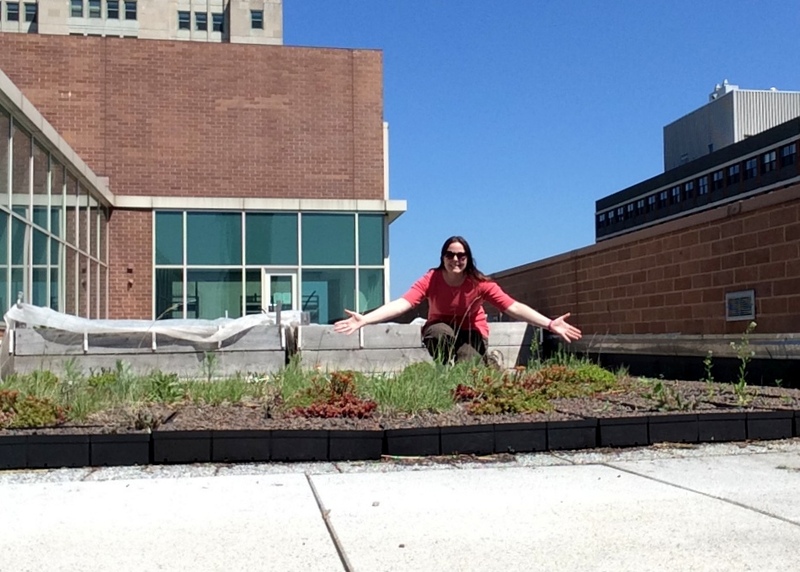 The experimental green roof trays at Loyola University are looking good! 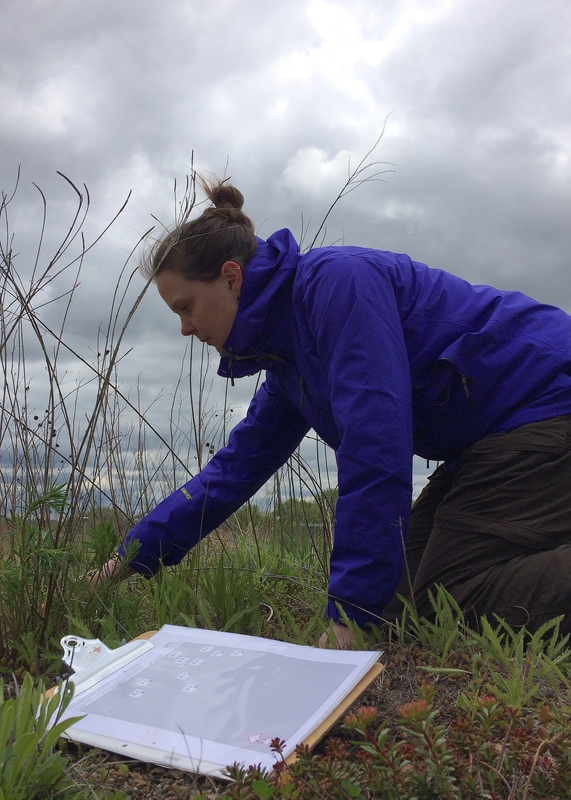 Early in the month, I wrote a blog post of a different kind for the main blog at the Chicago Botanic Garden, describing different ways in which botanists like me can share their research with a wide variety of people. About a week later I was also able to “walk the walk” as they say, and give a presentation to the Will County Audubon Society about how native pollinators can be supported by using native plants in urban gardens like the green roofs I study. The audience was very attentive and had some great questions – they even built their own “bee condos” which are homes for native mason bees. Later in the month, I was an audience member myself at an event hosted by the West Cook County chapter of WildOnes, an organization that promotes awareness of native plants and animals. At their annual Native Plant Conference, I was able to hear Dr. Doug Tallamy speak – he is a real champion of native plants and both his presentation and his book, Bringing Nature Home, were really inspiring! 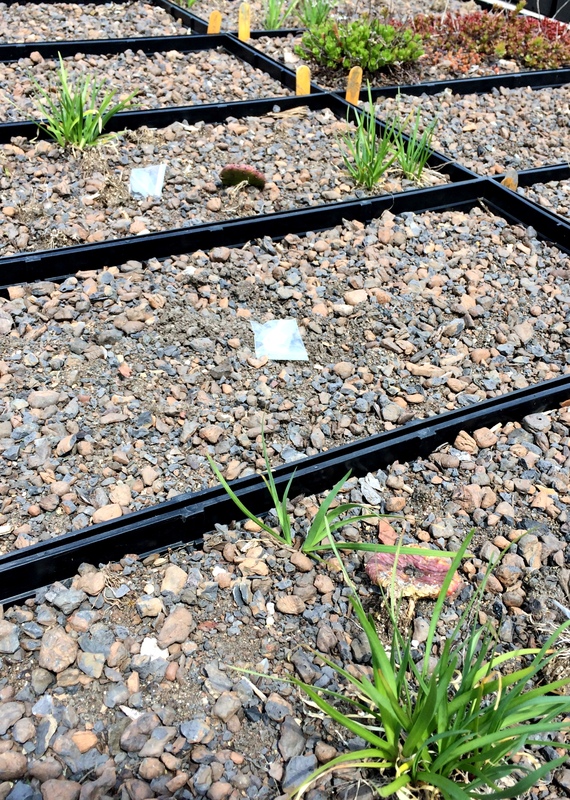 The temperature probes have all been read and are now buried in the green roof soil again. 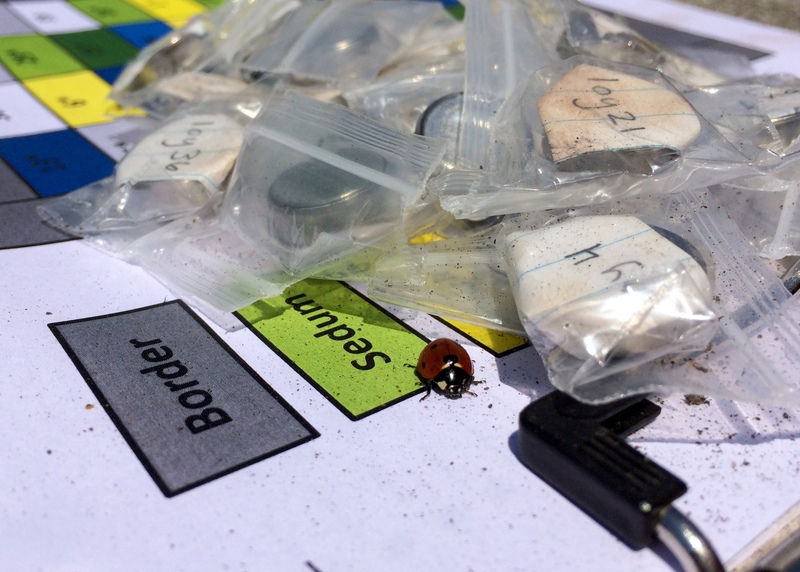 A little lady bug was also interested in my data! 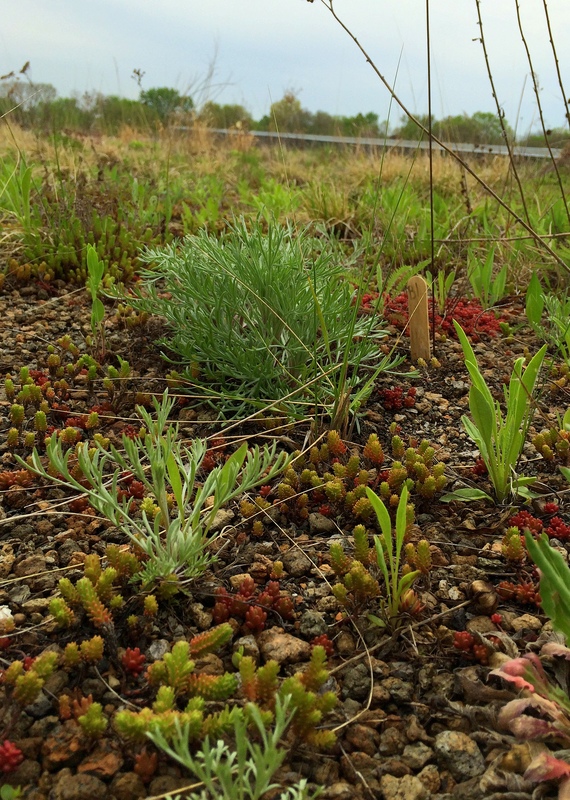 The native plants on the green roofs are still small but looking pretty good! Out on the roofs, my research plants are looking good. For the most part. 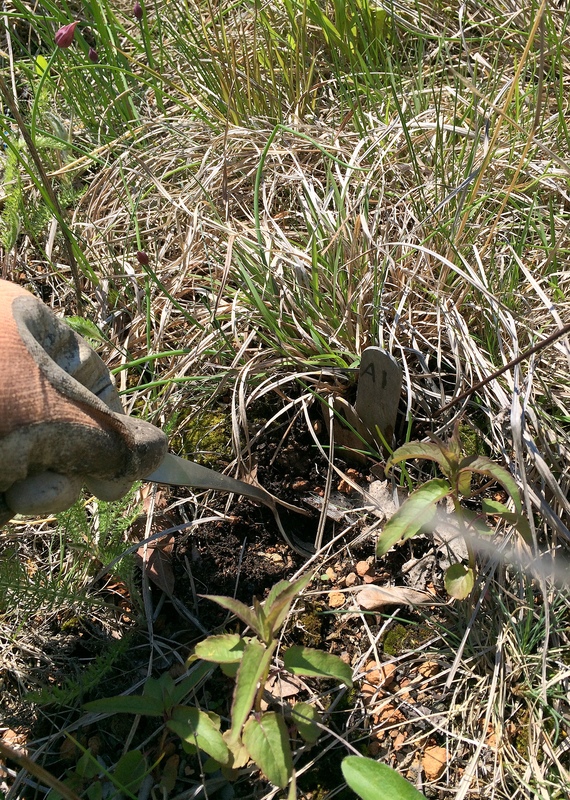 Of the 5 locations where I planted prairie plants, 4 of them are going strong and the other one… well… about 90% of the plants are dead. It’s a bit disappointing but that’s science for you. Not to worry though, I still have plenty of projects to keep me busy. 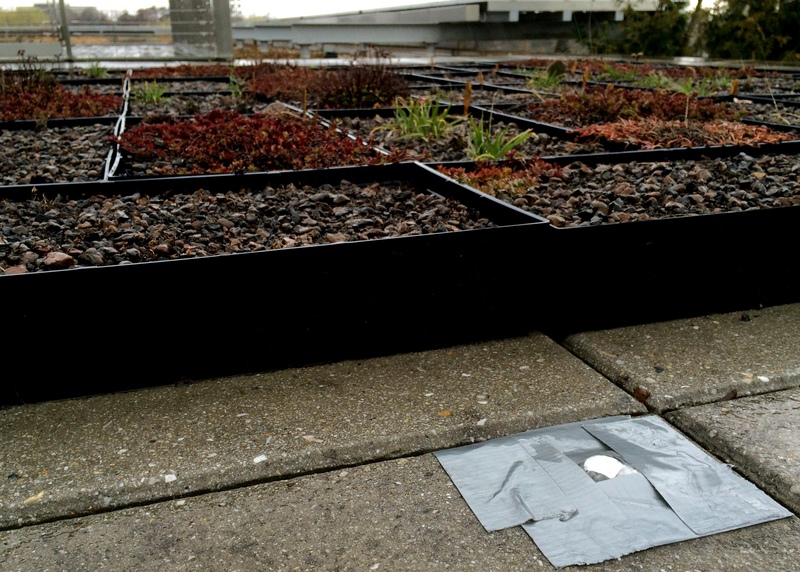 In May, I finished collecting all of the temperature probes from the green roofs so I now know just how cold it got on all the roofs this past winter (very cold, in case you’re wondering!). I started recording data on all the plants that survived the winter and how much they’re grown since last summer. I’ll continue to gather these data for the rest of the summer, so stay tuned. 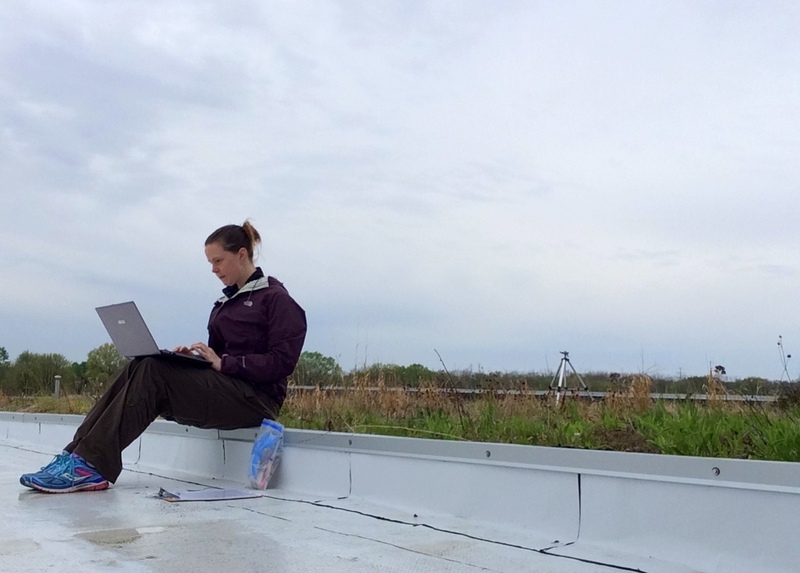 To record all the temperature data, I bring a computer up to the roofs. And then I cross my fingers that it doesn’t rain. I collected some interesting data about the evaporation rates in the green roof trays. This past month, I also started a new experiment, where I’m measuring the rate of water capture and evaporation from my experimental trays. I think that the trays with native prairie plants and the ones with the non-native succulent plants will be able to capture rainwater at the same rate. 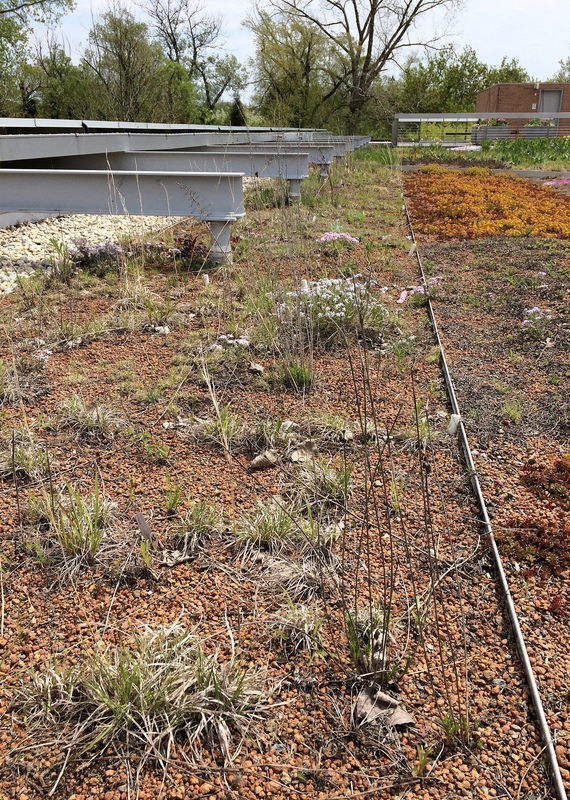 It is important for all green roofs to keep rainwater on the roof so it doesn’t run into already-stressed stormwater/sewer systems in the city. It’s also important for the green roofs to be able to release this water slowly in warm weather because this evaporation helps keep buildings cool. I measure evaporation rate by weighing wet trays every few hours. This was a great way to collect data but I learned that it’s also very physically demanding! Each time, you bend down to pick up a heavy (about 25-30 pounds) tray, bend down to put it on the scale, bend down to pick it up, and bend down again to put it back in its place. Multiply that by 40 trays and 6 rounds of measurements in 24 hours… well you do the math on that. Let’s just say that there’s no need to go to the gym on these evaporation measurement days! I carefully took about 600 tiny seedlings out of their petri dishes and put them into small test tube. I’ll extract the seedlings’ DNA soon. To get a break from the outdoor work, I also finished the task of germinating the seeds for my paternity experiment. I was hoping that the seedlings would get a bit bigger but they were just growing in this jello-like substance and they didn’t have the nutrients they needed to grow anymore. So I took about 600 of the seedlings, put them in tiny test tubes, and put them in a very cold freezer. I’m hoping that on rainy days this summer I’ll be able to start extracting their DNA and determine if pollen is moving between green roof to produce seedlings with parents from more than one green roof. There will be a lot more work involved with this experiment in the future. And finally, this month I was officially inducted as a Northwestern University Presidential Fellow! I am honored to be part of an incredibly amazing group of graduate students and am really looking forward to learning from them as well as sharing my research with this talented group of fellows.